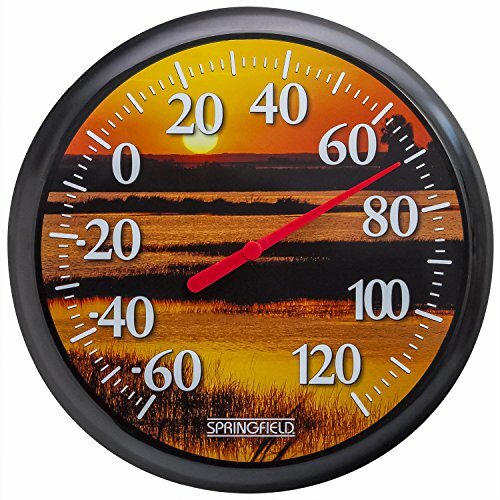 Watch the temps rise & fall with the seasons with the Springfield 13.25" patio thermometer. This big & bold Analog thermometer is a great way to add classic style & trustworthy temperature readings to your outdoor space. The low profile, high-impact resin construction adds durability while the clear view protective lens offers easy reading from across the yd. Quality, uv-fade-resistant graphics withstand the harshness of the outdoor elements. Bold & easy-to-read numbers track in 2 Degree increments with a design coordinated abs Pointer indicating temperature. Shatter & weather-resistant, this thermometer is built to last. A precision-made thermometer coil ensures accurate readings between -60 Degree & 120 Degree F.
If you have any questions about this product by Springfield, contact us by completing and submitting the form below. If you are looking for a specif part number, please include it with your message. EZRead Headwind Consumer Products 840-0081 Metal Thermometer/Hygrometer, Brushed Nickel, 4"